So, you’ve started either reinvesting in certain kitchen equipment or starting from scratch at the very beginning. There are hundreds of pieces of kitchen gear and appliances you can purchase to save time, make messes easier to clean up, or just make your life easier in general. A Dutch oven, though not nearly as popular as it should be, is one of these tools. Dutch ovens, also known as casserole dishes, have coined the name since about the late 17th century. The Dutch had a more advanced cooking system than the English, and they produced the cast metal cooking vessels that became popular worldwide. Mixed with centuries of American, Dutch, English, and other cultural histories, the Dutch oven has been crafted into a viable option for hundreds of different meals. The Lodge Color EC6D43 Enameled Cast Iron Dutch Oven is our number one choice for the best Dutch oven on the market. This was only concluded after careful deliberation and consideration, however, so we have many other options listed as well. This is because we didn’t feel right just listing one product when there are so many other Dutch ovens that can meet the needs of someone looking for something specific. Instead, we’ve listed a variety of specialized options, as well as the countless benefits, questions, and other important things to know about Dutch ovens. Many question the need for a Dutch oven when slow cookers are virtually the same thing and so much easier to find – usually for cheaper, too. However, a Dutch oven has individual benefits that sets it apart from just a standard slow cooker. There are many benefits to a Dutch oven that only those who actually use Dutch ovens will be fully aware of. With slow cookers or anything other than a Dutch oven, you have to brown the meat ahead of time before you can add it to the dish you’re making. With a Dutch oven, you can do everything from start to finish in the same pot. Because a Dutch oven gets hot enough for you to brown the meat with the meat inside it, you can just cook the meat, then go from there. A slow cooker finishes cooking things slowly, especially given the name. If you were to use a Dutch oven to cook the same foods you’re attempting to cook with a slow cooker, you cut up to two hours off your overall cooking time. For example, larger cuts of meat, like whole shanks, normally takes just 3 hours in a Dutch oven. In a slow cooker, it can take easily 4+ hours to get the same effect. A Dutch oven doesn’t reduce liquid the same way that a slow cooker does. Instead, you can make braises and stews thicker just by using a casserole dish instead of a slow cooker. While Dutch ovens range in size from 2 quarts to 14 quarts, the typical average for a slow cooker stays back at 5 quarts. While you can get a slow cooker or a Dutch oven of just about any size, it does play into the Dutch oven’s favor that there’s more versatility as far as capacity is concerned. A slow cooker has to be plugged in to a separate power source just like any other electronic appliance. A Dutch oven, on the other hand, can just fit on the stove or in the oven. Because of the versatility in where you can store and cook things when they’re in the Dutch oven, it makes it a much more viable option. There are different Dutch oven materials that can change the way various food cooks in them, changes the speed at which food cooks, and much more. Understanding what types of materials are out there and finding the best one for your particular situation is the easiest way to finding a Dutch oven that fits all of your needs. Sometimes, understanding the different types of Dutch oven materials being used will allow you to see that you can’t use a certain material for some reason or another (a plain cast iron Dutch oven is not recommended for electric range oven and stoves, for example). When it’s been properly seasoned, the plain cast iron Dutch oven is the original non-stick appliance that works every time. This type of cookware is most recommended for those who find themselves doing a lot of searing and blackening. Everyone should have at least one plain cast iron skillet, if only so they can use it for broiling. Really, the best way to go about finding the best plain cast iron Dutch oven for your home is to find one that has a handle that’s easy to use. Bonus if it’s pre-seasoned. Since you don’t have to season the enameled cast iron Dutch ovens before using them, they make the non-stick situation even easier. Enameled cast iron is one of the most versatile, able to be used on the grill, oven, or stove. It’s thicker than its plain cast iron counterpart, but this also means that it’s got a lower thermal conductivity temperature as well. In most cases, the enameled counterparts are typically a little more expensive than any plain cast iron Dutch oven, but many find the enameled surface invaluable in their cooking routine. A cast aluminum Dutch oven, skillet, or any other type of pot or pan is going to be lighter than the majority of its iron counterparts. They aren’t as common as their stainless steel rivals, mostly because a stainless steel Dutch oven is going to have a copper or aluminum base anyway. Typically, the most expensive out of all the different types of Dutch oven materials, stainless steel casserole dishes do have the added bonus of typically coming with a lifetime warranty. It doesn’t react to any type of acidic food and doesn’t change the color of sauces like a seasoned plain cast iron Dutch oven would. In the end, there’s no type of material used to make a casserole dish that is leagues ahead of the others. Each material has its pros and cons, and there are benefits of using them for different situations. You’ll have to base the material you choose off of the meals you’ll be cooking, preferred overall weight of the pot, and much more. We didn’t just close our eyes and point at the Lodge Color EC6D43 Enameled Cast Iron Dutch Oven for our number one choice. It actually took hours of testing, deliberation, consideration, and narrowing down of likely contenders. There’s a good reason why we selected this one for the best Dutch oven on our list, too. 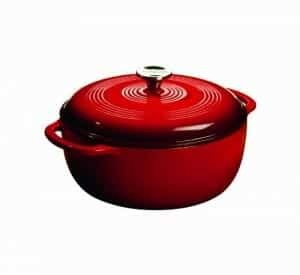 We had a lengthy list of variables and preferences in place that we matched up with the Lodge Color EC6D43 Enameled Cast Iron Dutch Oven before being able to determine that it was our number one. The variables we looked at will help you see whether our number one pick will also be your number one pick. First, we had to decide on which material would be best for a Dutch oven. We chose enameled cast iron because they have the best appearance, generally speaking. They’re also seasoned ahead of time, because of the material, saving you time and work. Once enameled cast iron was selected as our material of choice, we were able to narrow it down from there and determine the preferences we had to narrow the list down to just one. We took a look at all of the reviews and ratings for all of the Dutch ovens we considered. Obviously ruling out any casserole dishes that have particularly low reviews, this allows us to find the dishes that are being raved about. The only reason we want to find those types of dishes is because the dishes that are raved about are typically made of the highest quality and will last you the longest period of time. While this isn’t always the case, we still don’t want to select a Dutch oven that has poor reviews or a limited number of reviews. We’re focused on the products that have already been around for long enough to gain popularity or not. The range in size availability is a feature we looked for, but it wasn’t an absolute must. The range in colors is the same way. Honestly, having the choice to select a different size or from an array of different colors or designs just means that you have more options when it’s actually time to hit purchase. Price, additional features, and add-ons are factors that we look for when trying to find the best Dutch oven. We tried to find something that isn’t overly cheap or overly expensive. Bonuses like an extended or lifetime warranty, free shipping, or just being dishwasher-safe are all pluses. The Lodge Color EC6D43 Enameled Cast Iron Dutch Oven impressed us with the versatile options, features, and quality of the product itself. This Dutch oven is a special find in a sea of other products of similar quality. Many customers, including those on our team who were able to test the Lodge Color EC6D43 Enameled Cast Iron Dutch Oven, rave about the thickness of the sides and bottom. It’s got a sufficient amount of thickness and durability without sacrificing any heating time. You can heat food in this Dutch oven evenly, consistently, and easily without even having to season the pot ahead of time. Because this Dutch oven comes pre-seasoned, all you have to do is pour in the ingredients and start cooking. The versatility of choices for the Lodge Color EC6D43 Enameled Cast Iron Dutch Oven is another reason we had to land this in the number one spot. It comes in a 3 qt. capacity, a 6 qt. capacity, and a 7.5 qt. capacity. It also has 9 different color options, including Island Spice Red, Caribbean Blue, and Emerald Green. This is the kind of versatility we like to see in the Dutch oven that we select for first place. While it’s dishwasher-safe, it’s still recommended to wash the Lodge Color EC6D43 Enameled Cast Iron Dutch Oven by hand. If there’s a Dutch oven that holds first place in our book, then logic would dictate there’s also a second place holder. The Le Creuset Caribbean Signature Round French Oven is held firmly in that position. The enameled cast iron that the Le Creuset Caribbean Signature Round French Oven is made out of offers superior heat retention and distribution. The composite knob on top of the Dutch oven can withstand temperatures up to 500 degrees. The handles are made 45% larger than Le Creuset’s last model to ensure that everyone can get a sure grip, oven mitts on or not. Finally, the bright, colorful, long-lasting enamel that this model is coated in resists cracking and chipping, allowing you use out of this Dutch oven for years or decades to come. The versatility of options for this model even exceeds the Lodge Color EC6D43 Enameled Cast Iron Dutch Oven in first place. What’s is 11 different color options, including cherry, dune, truffle, and palm. Not only does it have an array of colors to choose from when purchasing it, but you can also choose five different size capacities: 4.5 qt., 5.5 qt., 7.25 qt., and 9 qt. With the strong, long-lasting durability and overall versatility of the Le Creuset Caribbean Signature Round French Oven, you may be questioning why it didn’t land in the first place position. The Le Creuset Caribbean Signature Round French Oven has a lifetime warranty. For anyone who has the money to spend on it over our first place choice or another option, it’s worth the extra investment. This non-stick cooking kit is the perfect answer to those trying to get high-quality kitchen products on a budget. Plus, this particular cooking kit is designed for camping, hiking, and other fun outdoors, so it’s very versatile in its use. Not only does it come with a Dutch oven with a lid, but it also comes with a frying pan, a soup spoon, a rice ladle, a loofah sponge, two plastic bowls, and a mesh bag to carry everything in conveniently. Sometimes, it takes a special type of Dutch oven or other kitchen product to really optimize your experience. While most Dutch ovens are going to be versatile enough to fit your needs, it’s always nice to get a glimpse of what each Dutch oven was best designed for. This also allows you a chance to see other products that may catch your eye over our first place choice or the other Dutch ovens we’ve listed so far. Everyone has their own individual preferences; one of these may fit all or most of yours. Already seasoned and ready to use, you can start cooking immediately with the Lodge L12DO3 Pre-Seasoned Dutch Oven. It’s got a 9 qt. capacity to satiate just about any large group, and it’s sure to have a large enough capacity for family dinners. It’s heavy and durable, built with a self-basting iron cover and heavy-gauge wire bales. The overall design of the Dutch oven is what allows it to heat completely evenly all the way through. As you can tell, we really like products by Lodge. It’s only because Lodge is one of the leading brands for Dutch ovens, so they have a variety of high-quality Dutch ovens to choose from. The Lodge LCC3 Pre-Seasoned Cast-Iron Combo Cooker is no different, adding a 10.25-inch high-quality skillet to the mix at the same time. Made in the proud USA, it’s pre-seasoned so that you can start cooking pretty much as soon as you unwrap it from its package. The sturdy handle comes with a reliable hole so that you can hang both the Dutch oven and the skillet when you’re not using them. While the King Kooker Pre-Seasoned Outdoor Cast Iron Dutch Oven is made for the outdoors, it’s also designed to be excellent for both frying and roasting. Made easily for chili, soups, stews, and gumbos, it’s easy to see how good a pot roast could taste in this thing. It come pre-seasoned with an 8 qt. capacity, meaning it’s great for a family dinner or some other big meal. The cast iron lid and feet attached to the bottom of the pot make it easy to tote around outside and set down without having to worry about it staining or getting too dirty. When it’s time to get out in Mother Nature and be one with it for a while, you don’t want to come out of it when it’s time to cook. Take the Lodge Camp Dutch Oven with you so that you can just build a fire wherever you’re camping and cook on the spot. It also works with fireplace cooking, and the cast iron lid can be inverted to be used as a griddle. It’s got a 1 qt. capacity, 4 qt. capacity, 6 qt. capacity, or 8 qt. capacity depending on your preference, how long you’ll be camping, and how many people you’ll need to feed. If it’s just one meal and it’s just for yourself, the 1 qt. is an easy option. If you’ve got a big group and you plan on staying for two or three meals, the 8 qt. is a better option. Outdoor cooking is a little different from cooking while camping in the sense that you can cook outdoors on the deck at the back of your house. Since you can do it anywhere outdoors, the Volcano Outdoors 40-012 Dutch Oven is a better option for you. The high-quality cast iron comes pre-seasoned. The lid is domed to provide better heat circulation, and it has a convenient charcoal stacking ring so you have to do even less work. While we’ve already mentioned some products that come with an additional skillet, a few spoons, or other convenient accessories. If you’re actually looking for a Dutch oven that’s part of a big set, though, you need to think bigger. That’s where the Cook N Home 15-Piece Cookware Set comes in. In black, green, or red, you can get a 15-piece non-stick cooking set consisting of a 5 qt. Dutch oven, a 3 qt. covered casserole dish, two covered sauce pans, two frying pans, and five nylon accessories, such as a ladle and a spatula. This set is the answer to those just starting their kitchen product collection or to those trying to restock their collection after a few years of not purchasing anything. The heavy-duty aluminum offers even heat distribution. You can restock or start stocking up that collection at a very reasonable price. It’s perfectly natural to have questions about a piece of cookware that, generally speaking, isn’t used often. It’s got a bad rep as an out of date product to have in the kitchen, but those that use Dutch ovens and get to experience what they offer know the truth behind that. How Do You “Season” a Dutch Oven? Seasoning anything metal simply means allowing oil to be baked into the very pores of the iron. This allows for an easy-release, clean finish that only continues to improve with use. While every brand has some difference in the way they pre-season their cookware, this ends up evening out over use and doesn’t really affect the cooking performance. Some Dutch ovens will come pre-seasoned, but not all do (plain cast iron doesn’t generally come pre-seasoned, for example). It’s vital to apply a thin layer of oil to your steel or iron cookware after cleaning in order to maintain the seasoning already present. This is the only way, albeit easy, to have cookware last you for decades to come. How Do You Clean a Dutch Oven? Dutch ovens are a little temperamental when it comes to cleaning them. Immediately after use, soak the cookware through with hot water while you finish your meal. Never use soap, cold water, or a metal scraper on your Dutch oven. This can cause it to crack, the seasoning to be removed, or it can cause a soapy taste that can even transfer to the food. What is the Best Source of Heat for a Dutch Oven? While you can put your casserole dish in the oven or on the stove to cook what’s inside of it, in most cases, that may not be the best source of heat available. To add a little extra flair of flavor and juice to each meal, the most recommended material to use as a source of heat are charcoal briquettes. In some cases, certain models won’t allow charcoal briquettes to be used or another source of heat is actually a better alternative. In this case, you can use wood as charcoal’s replacement. How Do You Get Tough Stains Off of Enamel? Persistent stains on anything can be a headache. When you have a tough stain on your casserole dish, it’s recommended to just soak the cookware in a mixture of bleach and water for a couple of hours. This is the best solution unless you have food residue that’s been baked on that refuses to come off. In that situation, all that’s needed is 2 tbsp. baking soda stirred into 1 cup of water. This baking soda mixture should be boiled in the cookware. How Do You Remove Rust from Cookware? If you have profile rusting on a Dutch oven that you’ve had for a good amount of time, steel wool over the affected area is the best solution. It’s important to season your Dutch oven again immediately after scrubbing over the areas with the steel wool, however, or you could risk cracks and breakage. If you’re experiencing flash rusting on a relatively new piece of cookware, though, all that’s needed is a cloth and a couple drops of vegetable oil. Rubbing the cloth with oil over the affected area briskly is the best way to remedy this type of rusting. Whether you go with our number one recommendation of the Lodge Color EC6D43 Enameled Cast Iron Dutch Oven , you invest in the Le Creuset Caribbean Signature Round French, you go with a different Dutch oven on the list, or you go with one somewhere else altogether, now you understand the variables to look at and which material is going to work best for you. Finding the best Dutch oven for your particular needs is the only way you’re going to get one that works for you and will last you years or decades to come.